An absolute monarch became the central element in the Russian political system. The Russian autocrat was a towering figure at the pinnacle of the pyramid of state, exercising total power in the country. There were no recognized formal limits on his political authority and no rule of law to curb his arbitrary will. In Western Europe, even in the age of absolutism, monarchs had to reckon with the interests of powerful social groups such as the nobility and the bourgeoisie, and they often faced opposition in the form of a parliament, or municipal councils, or self-governing religious bodies. By contrast, the absolute rule of the Russian tsars met with no opposition from society. The tsar’s autocratic authority was in complete possession of the political and civil liberties of its subjects. Eventually, the state concentrated in its hands the control and distribution of the nation’s entire human and material resources. The result of the centuries-long evolution of Russia’s distinctive political and social organization was that social progress became possible only through state regulation of all aspects of socioeconomic development. In contrast to the West, where social progress was achieved through the natural development of economic relations, the Russian state drew its strength and vitality from the use of non­economic methods, such as coercion. The unlimited power at the disposal of the autocratic government and the enforced and often brutal manner in which it thrust it reforms upon society generated the perception of reforms as revolutions from above. 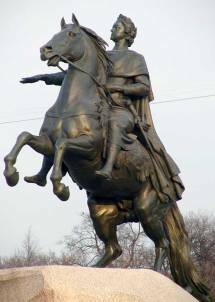 Peter was the first Russian ruler who inaugurated the pattern of a revolution from above as a chief mode of Russian modernization. This pattern – and the disregard for human sacrifice that it entailed – would be maintained down to the end of the tsarist regime in 1917 and beyond.